American and Mexican riders ride North on the Columbus Highway from the Palomas, Mexico, border crossing, where they were let into the U.S. by Border Gate Manager, FASF Trustee, Bill Wallace III. 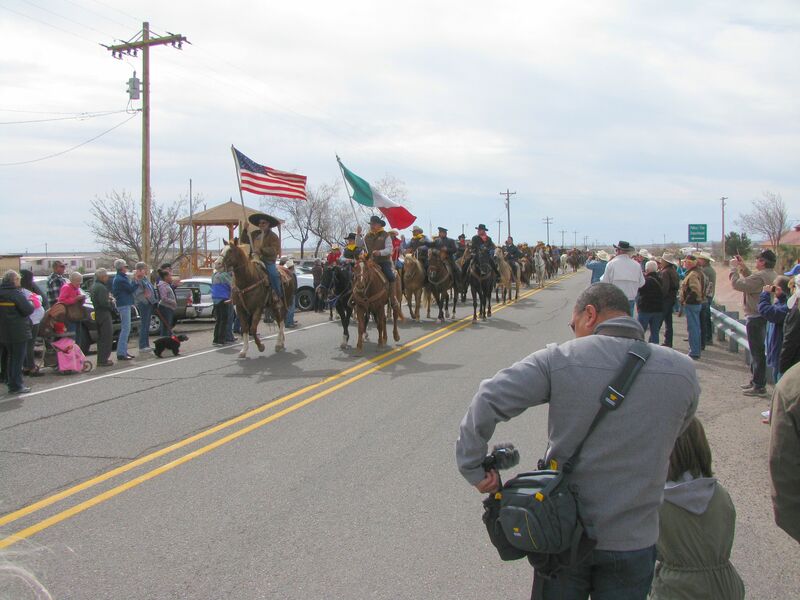 Mexican riders from deep in Mexico joined in this bi-national annual event in this joint Columbus, NM – Palomas, Mexican display of cooperative hands-across-the-border friendship. 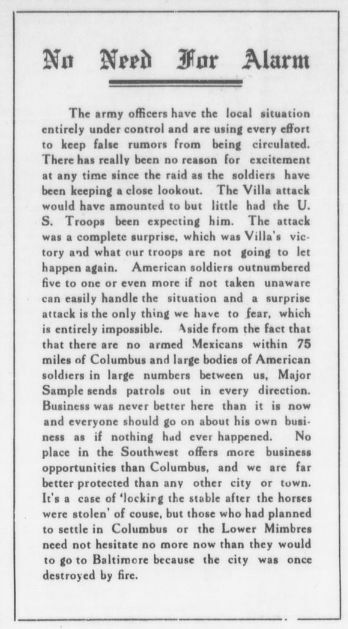 This statement was on the front page of the Columbus Currier Newspaper, dated March 24, 1916. 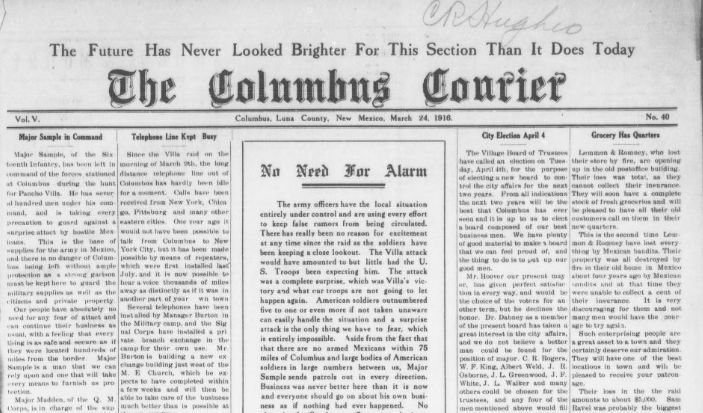 Notice that it took three issues of the paper to even make note of the horrible raid of March 9, 1916. The issues of March 10th and the 17th must have been away at the printers since BEFORE the raid, or they would surely have mentioned the calamity. Imagine the difference between today and then. Today news is posted immediately on the Internet and within a day for daily news media, not two weeks as in 1916. * The above two newspaper clippings are thanks to the guidance of Dr. Robert Bouilly, Fort Bliss Army Sergeant Major’s Academy Historian and Advisor to the FASF. These clippings are from the Library of Congress. We were lead to them by Dr. Bouilly. REMEMBER: To view any of these photos in full high resolution, simply click on it. What was once called “Raid Day” but is now known as “Camp Furlong Day” has come and gone once again. We have to thank the numerous FASF volunteers for helping the Day go down in the books as another successful experience in both public education and member recruiting. Above, L to R, are: FASF Aerodrome Site Survey Leader, Bill Madden, of Las Cruces, NM; FASF VP Roy Mantei, of Deming, NM; FASF members Jon Calder of Alvin, TX and Ray Thomas, of Lubbock, TX; and, kneeling, Russell Schneider;, then standing: John Smith; Louis Gonzales and Ira Pinkston, all of Las Cruces, New Mexico. 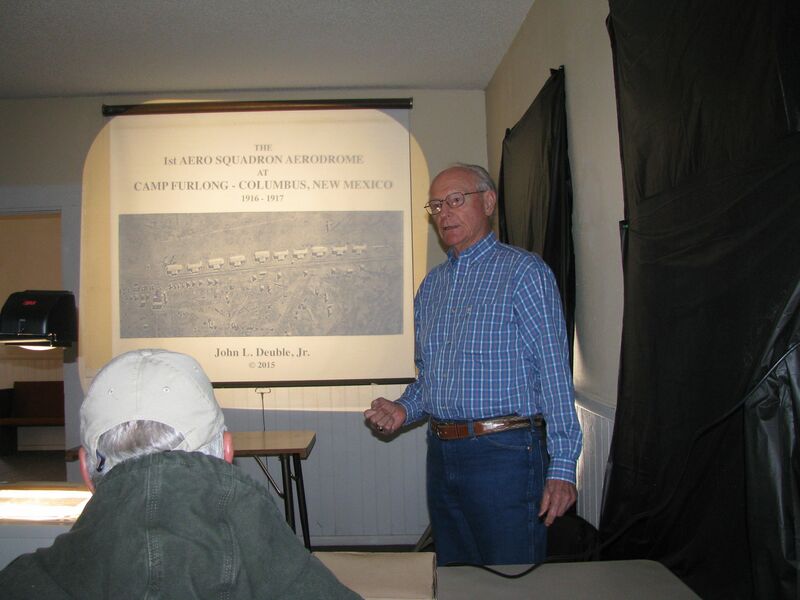 Our own long time member and professional historian, John Deuble, came all the way down from Albuquerque to give a brand new and insightful featured presentation about the First Aero Squadron at Camp Furlong in 1916-17. 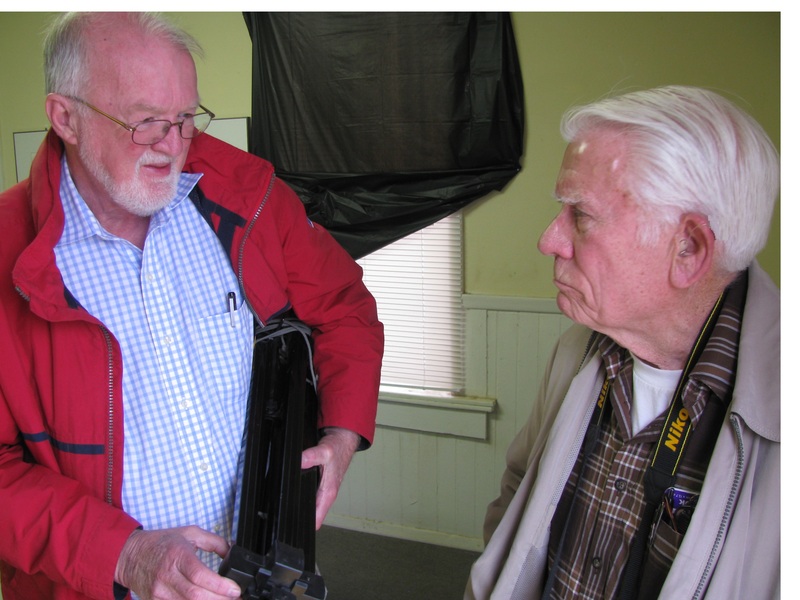 His pictures included some never seen before by some of our FASF members and by other local history buffs. John explored in some detail the many problems faced by both the young FAS pilots and their support personnel, as they cut their collective teeth on the first sustained combat deployment operation involving American aircraft. Mr. Deuble even described, along with vintage photos, how local industries came to life out of nowhere, simply because of the unique support needs for the FAS, such as their need for large quantities of fresh ice to feed their newly invented propeller “Humidors.” These Humidors were needed to protect the propellers from exploding in the air, because they tended to dry out so badly that their wooden laminated propeller structure would literally come unglued. Here, below, are more photos taken by your Aerodrome staff to help you see what – and who – you might have missed during this weekend celebration. 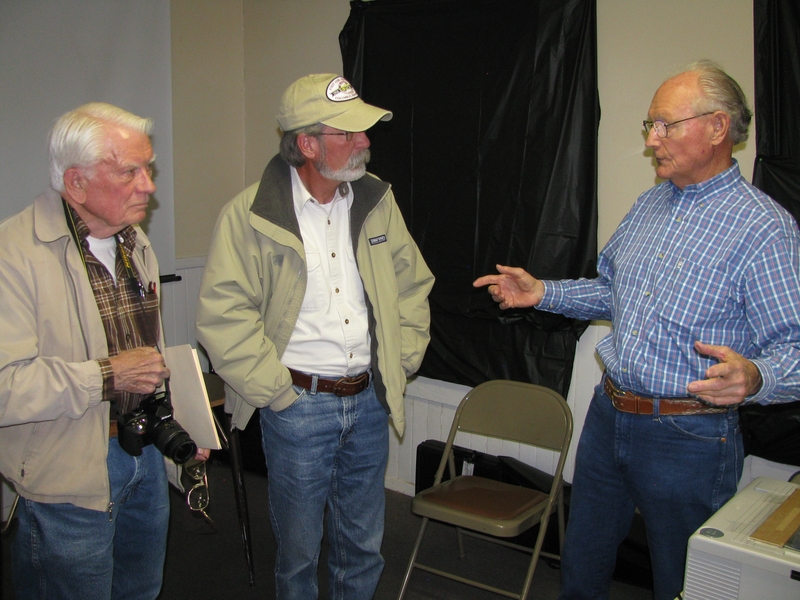 L to R: FASF Aerodrome Survey Team Leader, Bill Madden; FASF Members Jon Calder and Ray Thomas; and Roy Mantei, FASF VP. 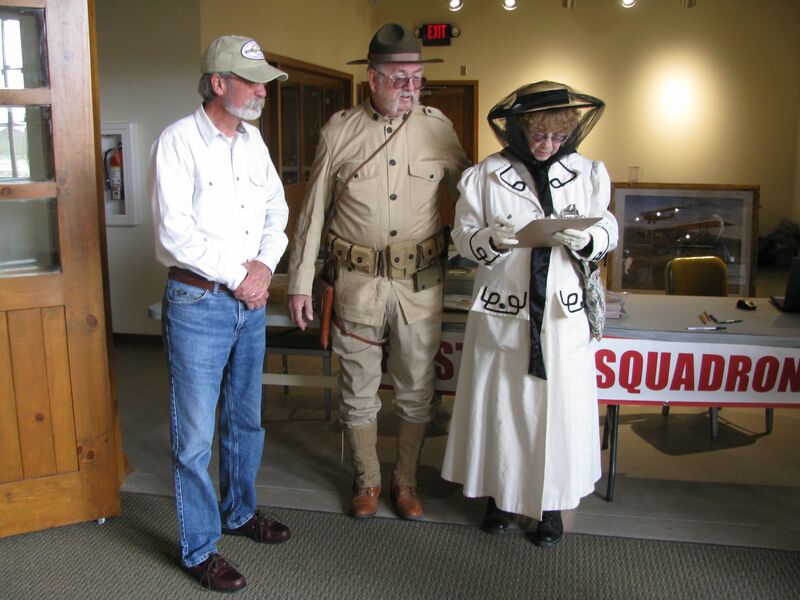 FASF VP, Roy Mantei signing up Ira and Alice Pinkston of the Las Cruces, NM Re-enactor group. 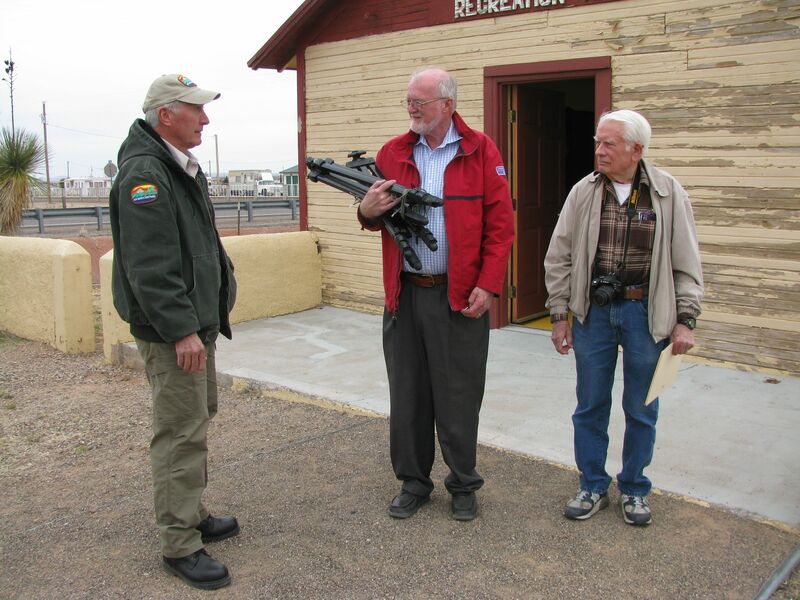 L to R: FASF Historian John Deuble, featured Presenter from Albuquerque, NM, discussing archeological FAS Airfield site photos with Aerodrome Site Team Leader, FASF Member, Bill Madden, of Las Cruces, NM. FASF Aerodrome Editor, July McClure setting up her sound equipment in readiness for the musical entertainment that followed. – At right are John Deuble, Bill Madden and Dr. Kathleen Martin. 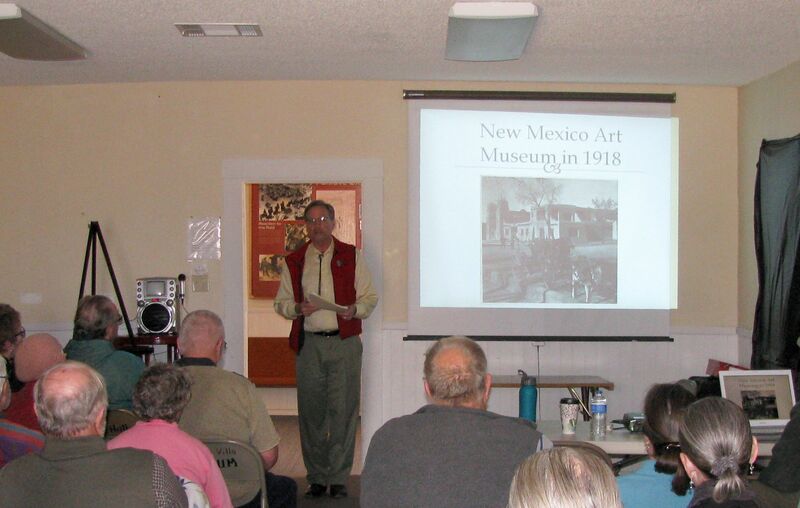 Pancho Villa State Park Manager and FASF Member, John Read (L) helping FASF Historian and author, John Deuble, set up his presentation. On screen is a 1916 aerial photo taken by an FAS pilot from his Jenny of the airfield’s flight line. 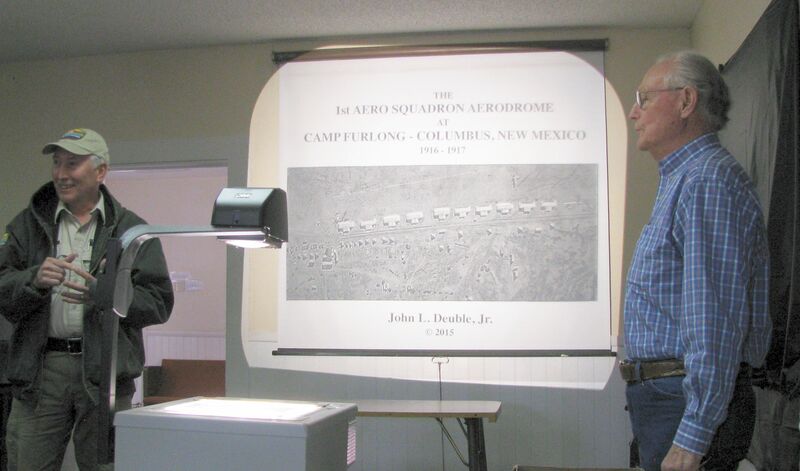 From L to R: John Read operating the slide show’s projector for fellow FASF member, author and historian, John Deuble, who closed the Camp Furlong event with his special presentation about the FAS and its accomplishments, day-to-day operations, tribulations and many innovative new aviation firsts during its days in Columbus 99 years ago. 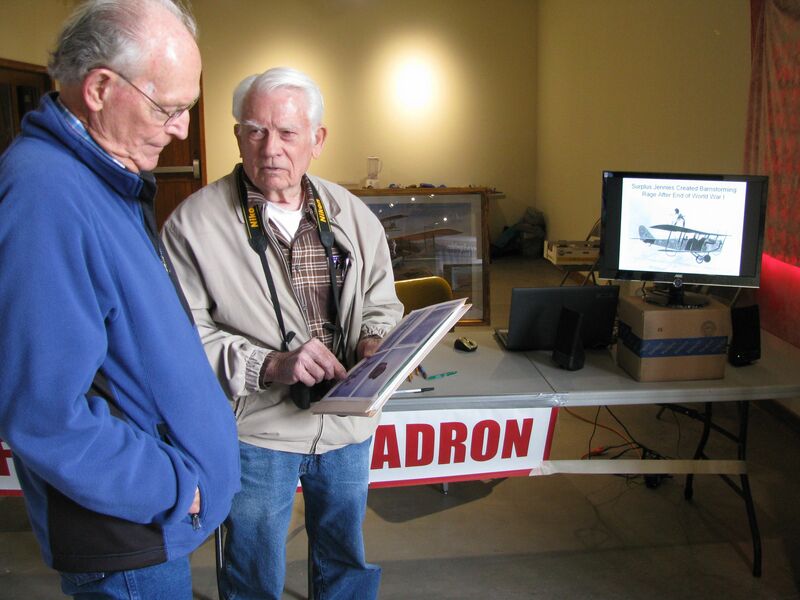 L to R: Dr. Robert Bouilly discussing FAS Airfield history with Bill Madden near the end of the event. 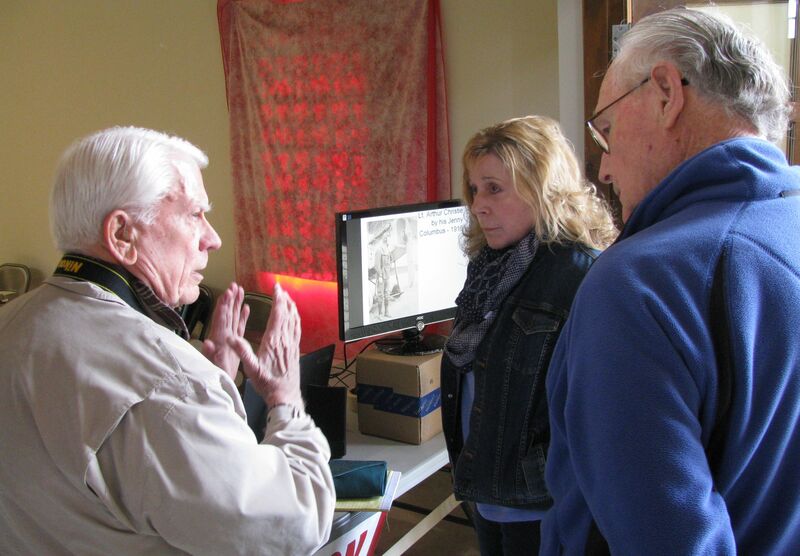 L to R outside the Camp Furlong Recreation Hall (an original building from the Punitive Expedition Days of a century ago), in which the day’s presentations were made), are John Read, Dr. Robert Bouilly and Bill Madden going over the day’s successful events. Members Bill Madden, our Aerodrome Site Survey Team Leader, our two Vice Presidents, Dr. Kathleen Martín and Roy Mantei, along with President Ric Lambart, helped manage the FASF display table once again, and Trustee Bill Wallace III played a key role in the event by acting as U.S. Mexican Boarder Crossing Gate Master, as he let the many Mexican caballeros, astride their horses, cross into the U.S. to take part in the celebratory event, some pictures of which you’ve seen above. 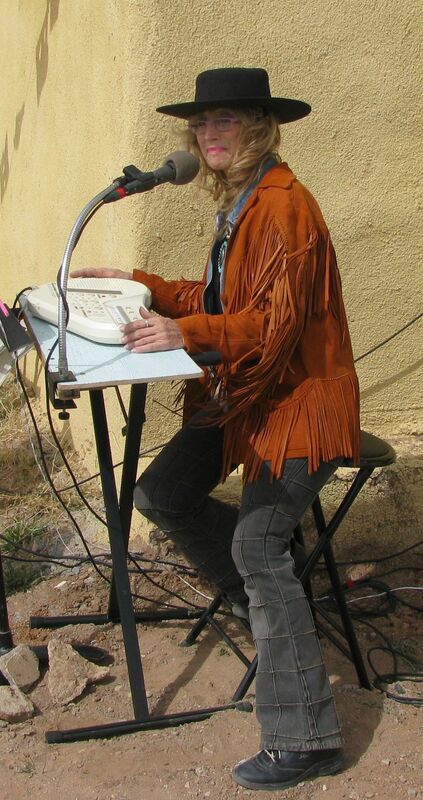 Our newsletter Editor, July McClure, was again busy entertaining visitors with her musical performance. 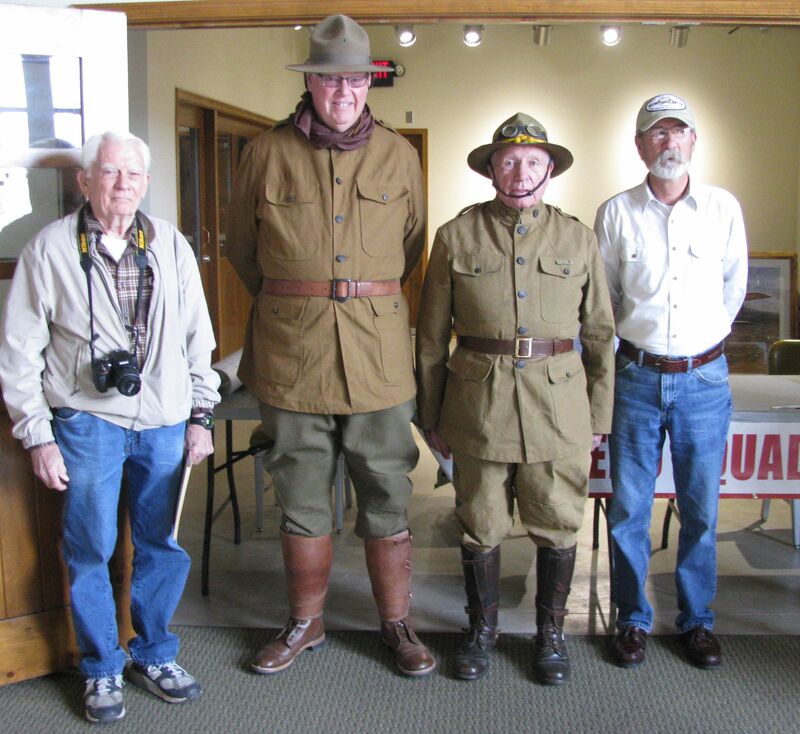 We even had some of our Texas FASF members, Ray Thomas and Jon Calder, both period Re-enactors, come over from distant Alvin and Lubbock, Texas. 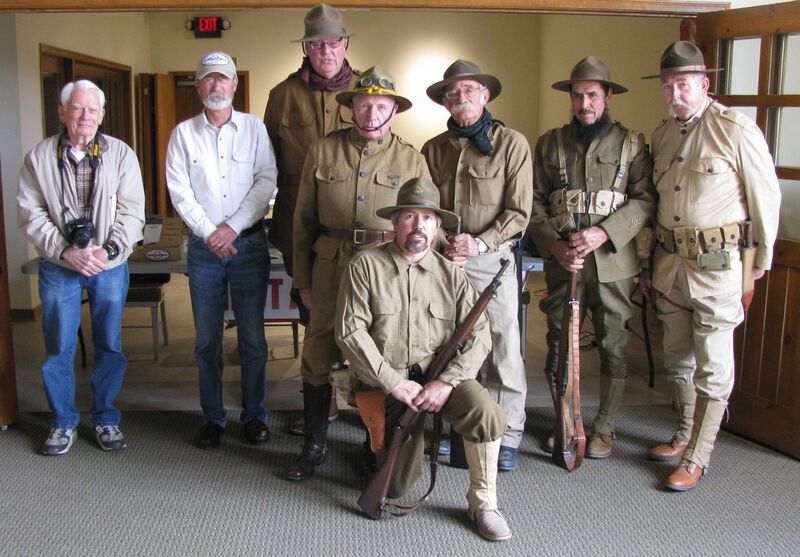 They joined up with some of the key 1916 and 1917 Calvary Re-enactors from Las Cruces, NM, to help plan for the big Centennial of celebration of the Birth of American Air Power in 2016. 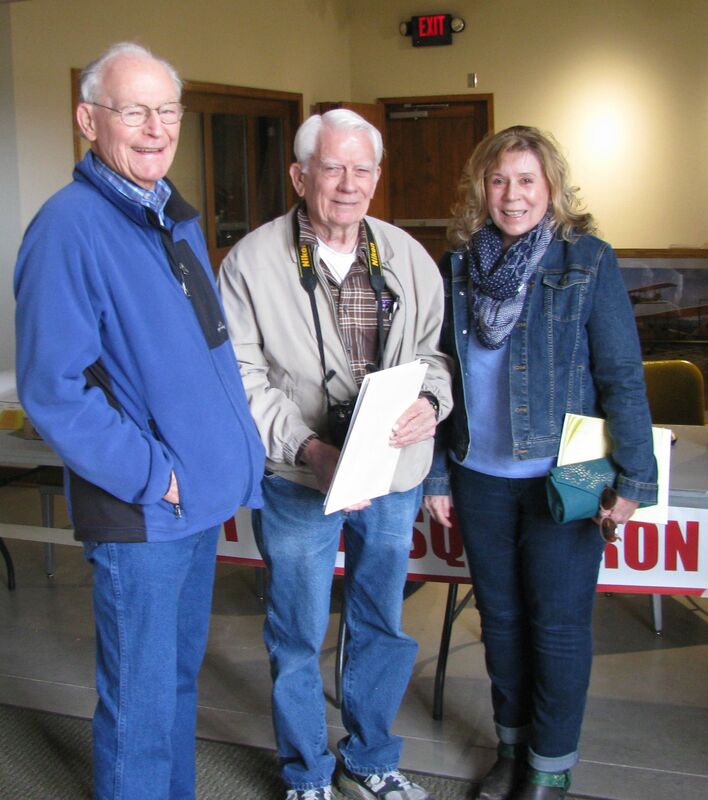 Of course, this big day in Columbus wouldn’t have gone as smoothly without another old FASF member, John Read, who again repeated his skilled organizing and management tasks during the event at Pancho Villa State Park, which is where the public educational presentations again took place. Dr. Robert Bouilly, frequent FASF Advisor and the U. S. Army’s Lead Historian at the Sergeant Majors’ Academy on Ft. Bliss, in El Paso, gave a special presentation about the role of the famous Buffalo Soldiers during the Punitive Expedition and of some of their little known exploits, particularly their prowess at the sport of boxing, both before and after this locally historic event of almost a century ago. FASF Membership Chair, Roy Mantei, reports we signed up some more new members, sold some FASF memorabilia, and helped inform a number of visitors about the important role played by the First Aero Squadron – not just 99 years ago, but in both WWI and during the rapid expansion of American Civil Aviation in the 1920’s and 30’s, prior to WWII. NMSU Professor, Dr. Jon Hunner, below, delivered a colorful and fascinating presentation about how the combat lessons learned in Columbus and in Chihuahua Mexico, during the Punitive Expedition, were helpful to the U.S Army when the U. S. finally entered the bloodbath going on in Europe and so often called at the time, “the war to end all wars.” Professor Hunner illustrated how interconnected what took place here out of Columbus turned out to be later over in Europe and even the Middle East, where the great war helped cause the breakup of the old Ottoman Empire into modern-day Turkey, Iraq, Jordan, Syria, Lebanon, Palestine, and Saudi Arabia, etc. – today’s leading area of U. S. long-running wartime involvement. Dr. Hunner also described how the victory of the Allies over Germany in that devastating war tragically helped lay the seeds that subsequently led to the rise of fascism in Germany, Italy, and Spain – and even of the take over by the Bolsheviks in Russia and the ensuing rise of Communism. After Dr. Hunner’s treatise is was more clear to many in the audience that the dynamics leading to and following WWI were all intricately interconnected, helping give rise to the greatly changed world of nation states that followed that long conflict – and that consequently also laid the fertile ground that gave rise to both WWII and the worldwide mayhem that has followed that World War. This entry was posted in HOT NEWS! on March 8, 2015 by FASFRIC. Can anyone please tell me what, if anything, remains of the 1939-42 CCC camp G-150-N at the State Park site? I’m researching CCC camps in New Mexico. I fear there’s nothing left of the camp here, but I’m not sure. Dirk, thanks for commenting on our FASF site! I’ve set the ball in motion, since I personally don’t have an answer to your interesting query. But someone of the several experts I just contacted might know something. So stay posted for whatever I might didscover for you. Cheers! 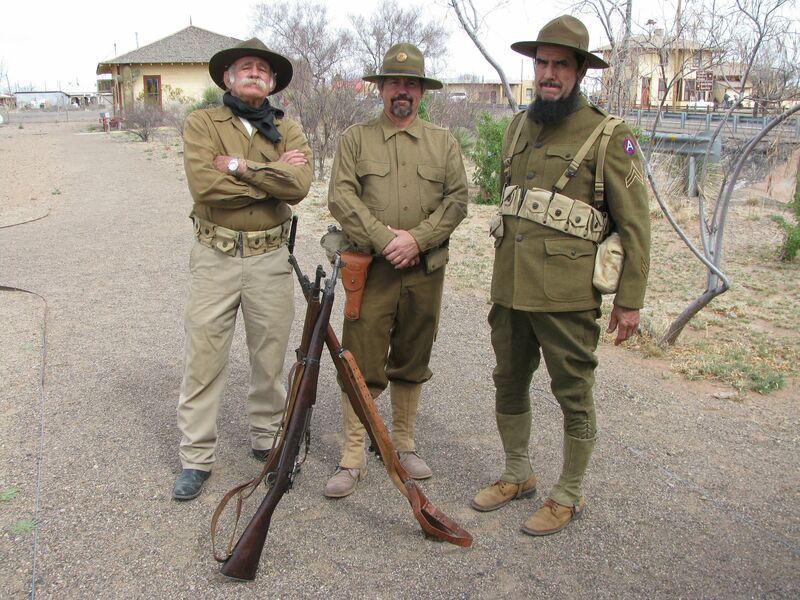 Mr. Van Hart: Just heard from Chief Park Ranger and Historian, John Read as follows: “The only structure remaining at Pancho Villa from the CCC workers is a concrete grease rack. As I recall, they did stay in the Rec Hall building . . . ” If I hear more, I’ll get back to you, again. Thanks for your inquiry!